The horror stories surrounding student housing are awful, and so here at SUSU we decided we wanted to do something about it. 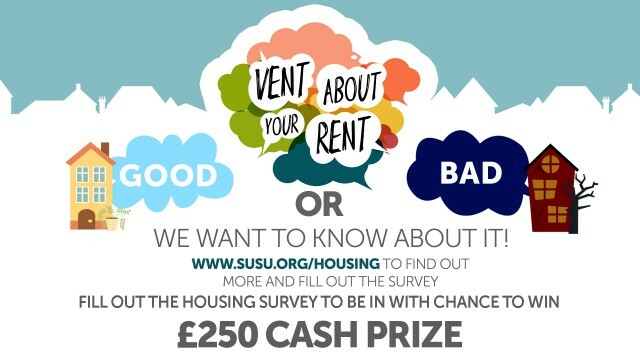 In 2012 we launched the Vent About Your Rent survey, which collects information from students across the board on what they think about their housing. This, standing alongside the SUSU Lettings Agency, has meant we’ve been able to help students avoid being pushed around by dodgy letting agents and rogue landlords. We’ve just opened up the survey for 2015, and need your help filling it in. Your answers will enable students next year to make informed decisions when finding their home away from home, and filling in the survey is the perfect catharsis if you’ve had an awful experience you need to vent about! The survey closes on June 20, and by submitting a response you’ll be in with a chance of winning a £250 cash prize.